Despite being of French origin, the abbreviation RSVP is no longer used in France, considered old-fashioned— but I didn’t know that when I first moved to France. Here’s everything you need to know about RSVP, its meaning in English and French, what it stands for, its origins and more. Plus learn how I made a fool of myself using it on my French invitations. What’s the meaning of RSVP in English? 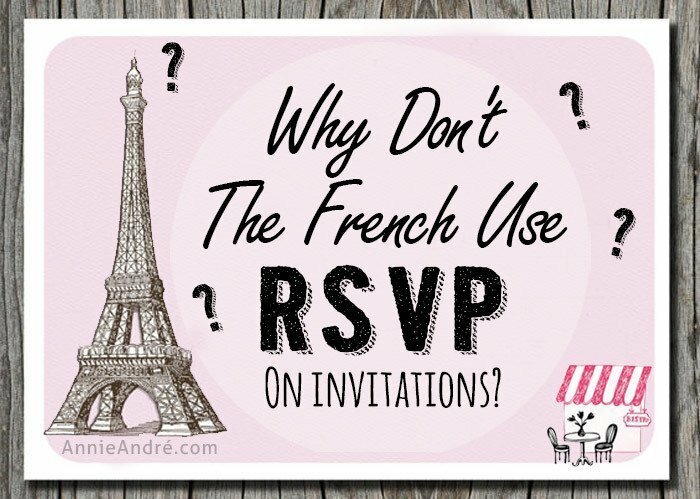 Silly me, I thought since RSVP was an actual French abbreviation that French people in France would understand it’s meaning. It turns out I was so so wrong. 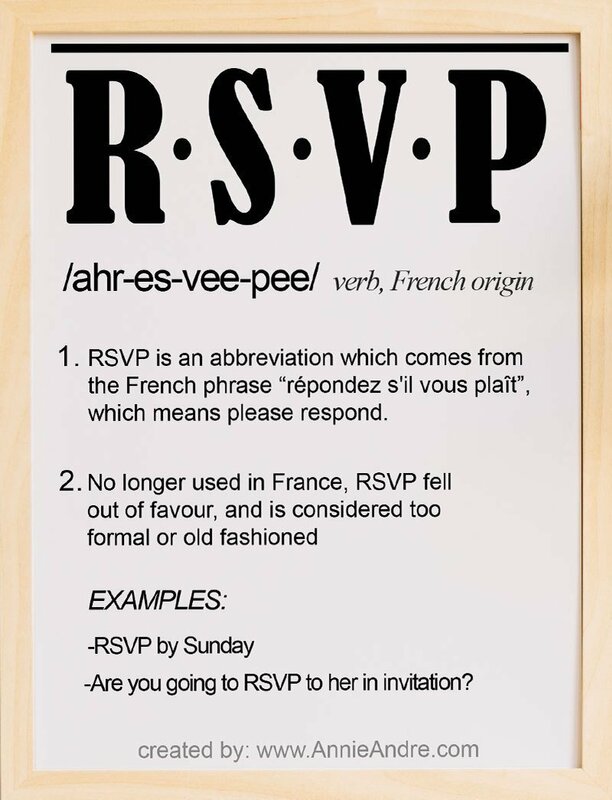 Like so many English words, RSVP is a French word adopted into the English language. 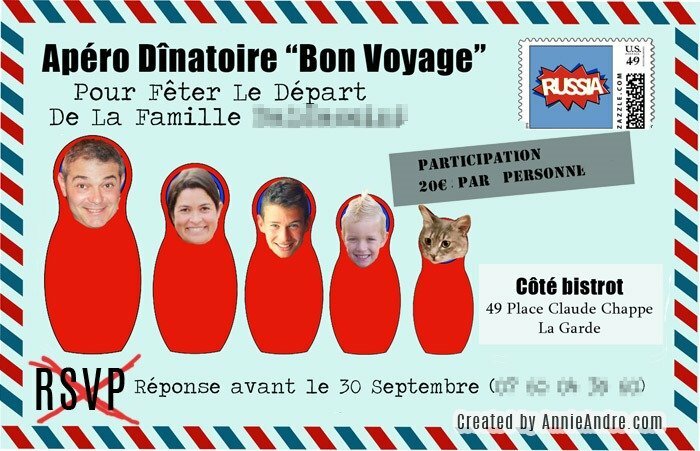 One of my good friends in France asked me to create an invitation (in French) for her going away party. She and her family were moving to Russia for three years for a job opportunity. I happily agreed and came up with the idea to make the invitation look like a postcard with five red Russian nesting dolls—one for each family member including the cat. I think the invitation turned out super cute! Don’t you? As I created the invitation in Photoshop, my girlfriends looked over my shoulder giving me annoying but welcomed feedback. 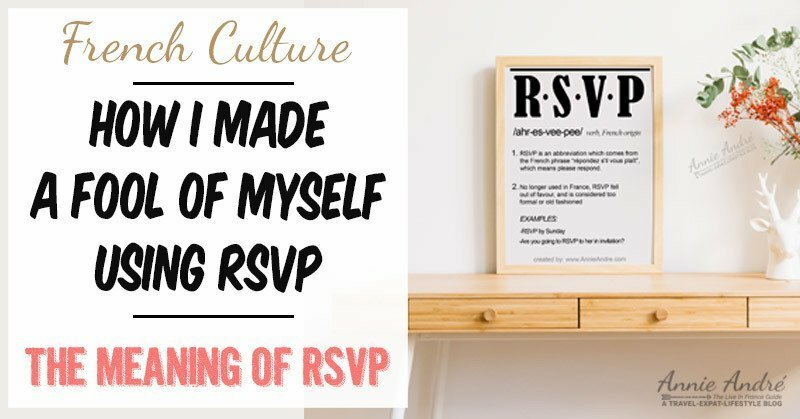 When it came time to type RSVP at the bottom of the invitation, one of my friends squealed in a high pitched voice “mais qu’est ce que c’est ça, RSVP?” which could mean anything from “but what is this RSVP?” all the way to “What the hell is that, RSVP?”. So yeah, I was a little confused. It took me a few minutes to wrap my head around this simple fact. I tried explaining to them how Anglophone countries use RSVP, but nothing clicked until I told them it was like adding “R” to “SVP,” short for “S’il Vous Plait,” a well known French abbreviation for the word “please”. They were intrigued by the use of “RSVP” in the English language but said we shouldn’t it on a French invitation because no one would understand what it meant. I was a little embarrassed and irritated because I had already created birthday card invitations for my daughter and wrote RSVP on them and nobody mentioned to me that they had no clue what it meant. 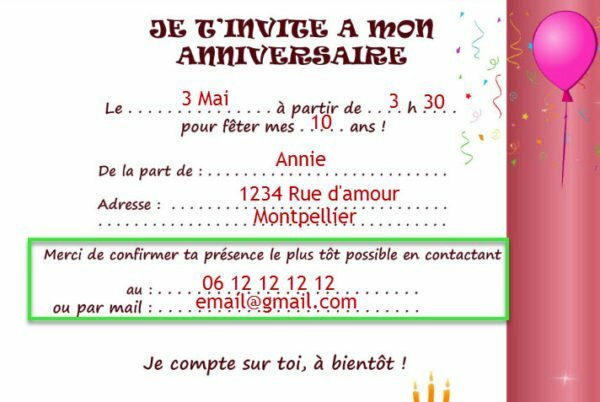 There are several ways you can request people RSVP on French invitations, but ultimately we went with “Réponse avant le 30 Septembre”, which means respond before the 30th of Septembre. Here are six additional ways you can ask someone to RSVP in French on French invitations. Personally, I like “réponse souhaitée” followed by my contact information- phone number or email. It’s simple and to the point. Not too formal and not too friendly. Why isn’t RSVP used in everyday French anymore? Like all languages, French has evolved, and as a result, many French words and phrases are no longer used in modern French, or the meaning has changed. RSVP is one of the many old French words or abbreviation in this case which has fallen out of widespread use by most French people today. Bébelle: Bébélle comes from thirteenth-century old French meaning” children’s toy”. My aunty in Montreal loves to say “Remasse tes bébélles” which idiomatically means (pick up your stuff). Croche : In French Canadian, this can mean anything from crooked to dishonest. But in France, it’s not really used at all anymore. How, when and why do English speakers use RSVP? 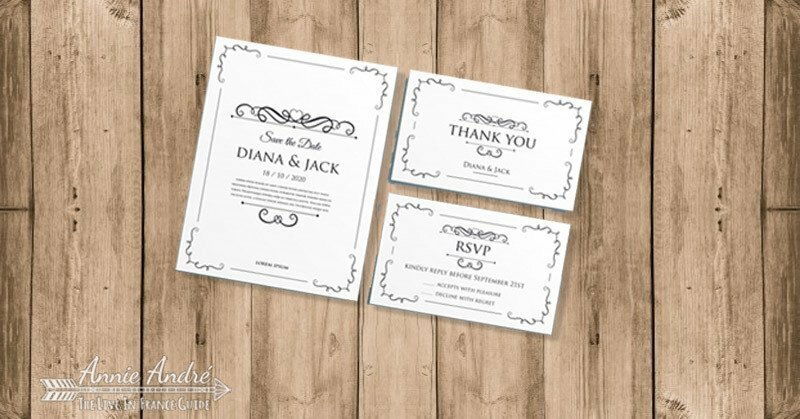 To understand how RSVP became standard on on invitations and cards in English speaking countries, you need to understand a little history. In the year 1066, William the Conqueror of Normandy invaded England and defeated the English King Harold II at the Battle of Hastings. William has subsequently crowned the first Norman King of England. When William ascended the English throne, he spoke little to no English. He actually spoke a dialect of French despite being of Scandinavian descent, which he made the official language of the king’s court. French remained the language of the English royal court for centuries and gradually blended with the Anglo-Saxon language— infusing it with new French words and giving birth to modern English. RSVP, often written R.S.V.P., eventually made its way onto English birthday cards and wedding invitations beginning later in the 11th century – French was still considered high fashion among the elite of the English court, and speaking French showed your elite status. This affinity for all things French continued in England for several hundred years then travelled across the Atlantic where it became fashionable among high society in the United States— using French words showed refinement. This trend continued until around the 19th century, and from this, RSVP and many other French words and phrases made their way into the English language and stayed despite it falling out of use in the French language.